Helen Spalding in Literature on 23 November, 2015. 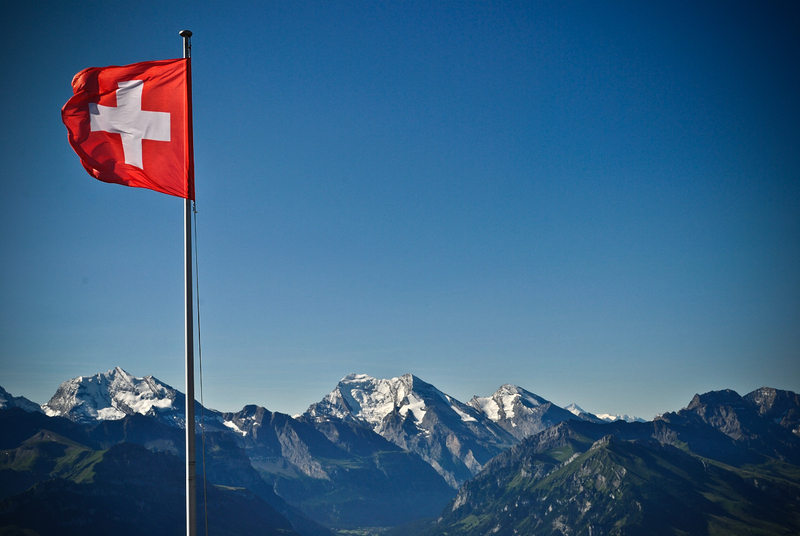 Flag set against Swiss mountain range. Harry Lime, played by Orson Welles in The Third Man, says of Switzerland’s culture and art, “In Switzerland, they had brotherly love, they had five hundred years of democracy and peace – and what did that produce? The cuckoo clock.” Given the more commonly known cultural representations of Switzerland being Heidi (Johanna Spyri), Swiss shepherdess with plaits, and the mountain range in the credits of The Sound of Music, it is understandable that Switzerland is not valued as a place of great literary importance. In actuality, Switzerland has acted as a home and a source of inspiration for many of the greatest literary minds, and also features as a setting in several influential texts. Switzerland has housed a great many thinkers and writers historically, perhaps due to its privacy, its beauty, its liberal political climate and, more recently, perhaps, its tax benefits. T.S. Eliot wrote “The Wasteland” while in Lausanne. Herman Hesse lived above Lugano for over twenty years. Vladimir Nabokov, James Joyce, Henry James, Thomas Mann, Voltaire, Igor Stravinsky and Charles Dickens are but a few other major literary names that have lived in Switzerland. Byron’s ‘Manfred’, Wordsworth’s ‘The Prelude’, Goldsmith’s ‘The Traveller’ and Shelley’s ‘Mont Blanc’ depict the beauty and majesty of Swiss countryside and sights. The Léman area of Switzerland, surrounding Lake Geneva (Lac Léman) on the Swiss-French border, is particularly famous for its Romantic literary history. Byron rented a mansion (Villa Diodati) on the shores of the lake, and this was host to many great literary minds, including Percy Bysshe Shelley and Mary Wollstonecraft Shelley. It was here that Mary Shelley’s great work Frankenstein was first conceived. Due to the eruption of Mount Tambora in Indonesia the year before, 1816 saw torrential rain and pervasive cold across the Northern Hemisphere. In this “Year Without a Summer”, Byron hosted a group of contemporaries (including the Shelleys) who, unable to leave the castle and confined to cramped and claustrophobic conditions, began to recount ghost stories to amuse themselves. It was there that the groundbreaking Gothic novel, Frankenstein was first conceptualised (an experience which Shelley recounts in the 1831 preface to this very novel). Remnants of the Romantic literary history linger on in modern Switzerland, as Léman tourism indicates. ‘The Prisoner of Chillon’ (or ‘Sonnet of Chillon’), is a 392-line narrative poem written by Byron in 1816 on his tour of the area further down the lake. It depicts the imprisonment of a monk, François Bonivard (imprisoned from 1532 to 1536 and the last survivor of his family), in Chateau Chillon. As a result of this rich literary history, Chateau Chillon is one of the largest tourist attractions in the Leman area, situated near Villeneuve at the far end of the lake from the better known Geneva. Byron carved his name on one of the prison columns (among the many other names of people incarcerated there), as a joke during his visit. It can still be seen today on tours of the castle, open every day of the year except January 1st and Christmas day. However, Switzerland has not only served as a creative home and holiday destination to writers, but has also found its way into their work, becoming part of the fabric of the texts. Perceived as both a political and social sanctuary and escape, with temperate fields and lakes, as well as a land of harsh extremes (glacial and mountainous), its representation is complex. For example, its beauty and tranquility draws Han Castorp in The Magic Mountain to Davos, in the Swiss Alps, to visit his cousin Joachim, a sanatorium patient. He himself becomes ill, convincing himself he has tuberculosis and losing seven years to the mountains. This haunted beauty – a beauty of damaging extremes – is also found in Dickens’ depiction of Switzerland in David Copperfield. As a result of his grief and emotional confusion, the protagonist travels to Switzerland, spending three months on a kind of intensive, emotional pilgrimage, suffering from the beauty of the Alps as they demand spiritual recognition and pain from him. Similarly, the extreme scenery of the Alps, such a contrast to the rural, quiet setting Women in Love opens with, paints a dramatic background for the death of Gerald, a central character to this text. The emptiness and the silence of the high mountains creates a lonely, almost nihilistic image of terrifying isolation. The beauty of Swiss landscapes in their variety and extremity incite powerful emotions in moments of epiphany, salvation and destruction. Given Switzerland’s quite extensive literary presence, it is unfair to reduce its artistic legacy to cuckoo clocks, shepherdesses with plaits, and musical mountain scenes – regardless of how glorious these tropes may be. Switzerland has served not only as a creative sanctuary for many famous writers throughout history, but has also been a source of creative inspiration: its landscape has provided writers with a setting crucial to the themes that they explore.